In my effort to get us caught up from the long hiatus, I figured I'd write this letter to hit some of the highlights of this past year. They are among my favorite memories, and I'm glad I had the foresight to take and save the pictures so I could write about them later. So without any further ado, here are memories that touch my heart and make me smile. 1. Brooks Family Spring Break Cruise - This past March, the Brooks Clan headed South again and went on a family cruise. Uncle Kurt, Aunt Stacey, Abigail, Uncle Ryan, Aunt Andrea, Grandma and Grandpa Brooks, and us cruised the Caribbean and went to Puerto Rico, Haiti, and other awesome locales and soaked up some sun and fun. 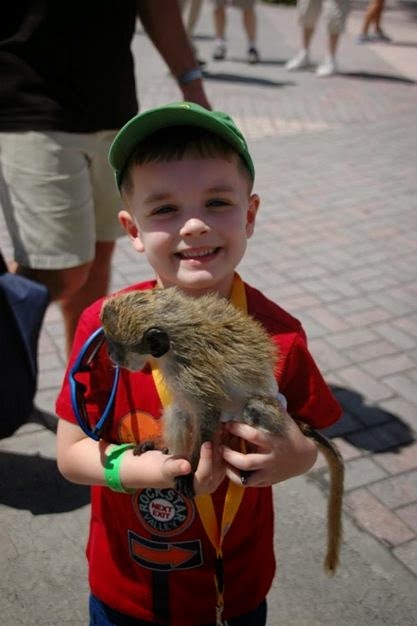 Here's you with a marmoset in Puerto Rico. Yes, I hand-sanitized the bejeezus out of you afterward. Having fun on the beach in Labadi, Haiti. You officially "getting" the concept of vacation. 2. Summer trip to Cohocton - It completely thrills my heart that when asked if you could go ANYWHERE in the WHOLE WIDE WORLD, you unerringly answer, "Cohocoton, New York." Sigh. And smile. Even though it is probably one of the smallest towns and places in the world, Cohocton holds a huge place in your heart. 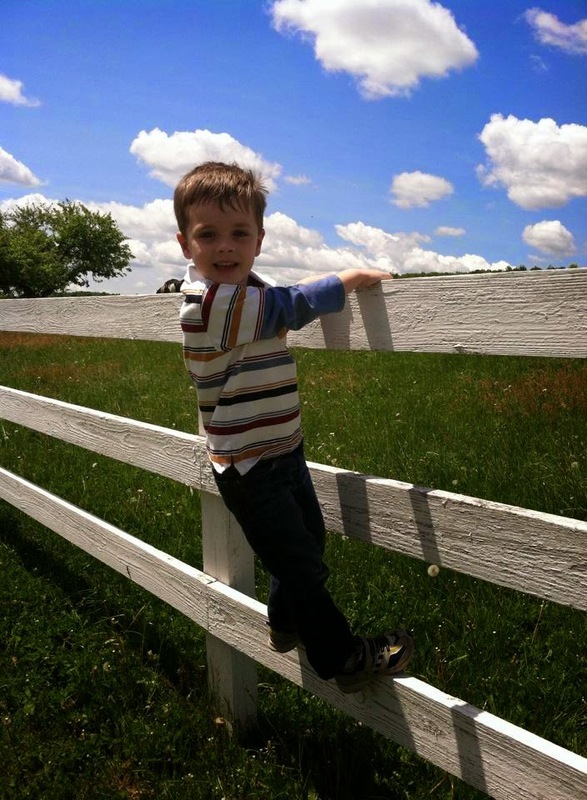 You love climbing the trees, running in the yard, picking apples, playing tractors and looking at trains. 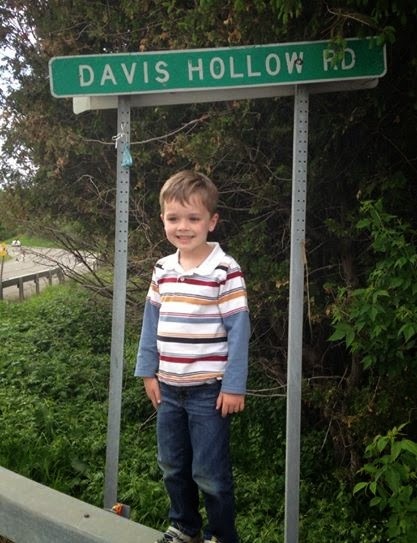 You, Grandma Davis and I drove all the way up there at the beginning of June, and we had the very best time. 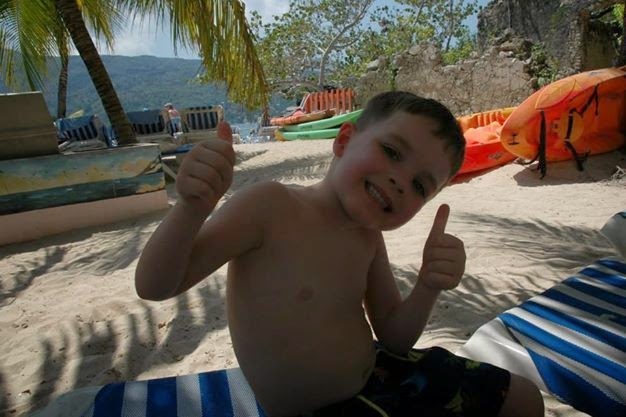 I love seeing you get back to being "all boy" and simply enjoying the simpler side of life. 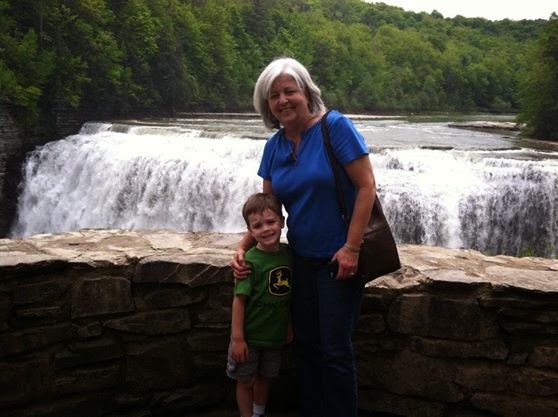 Hanging out at the Big Falls at Letchworth Park with Grandma. Running amok at Silver Meadows Farm (the Klines place). You fed cows, locked us out of the car, and helped Ms. Michelle dig in her garden. You and the family road sign. Makes me smile so big. 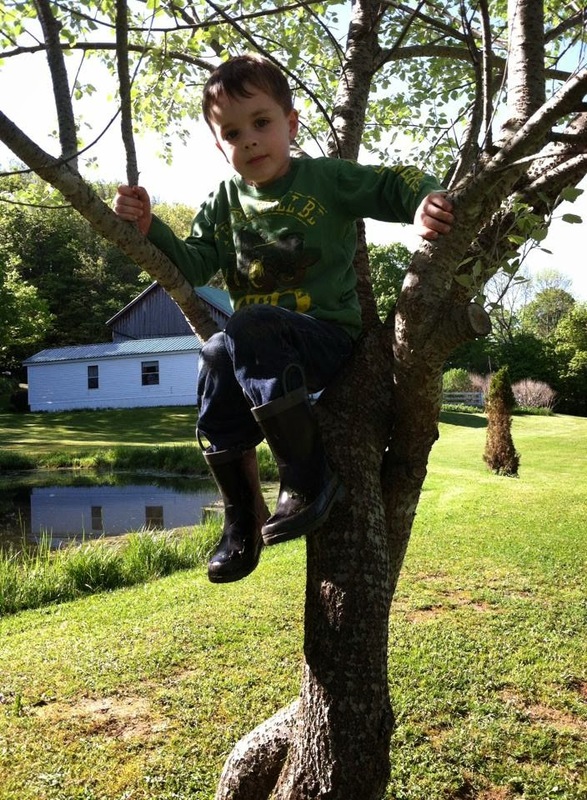 Being "all boy" and climbing Mommy's favorite tree. 3. 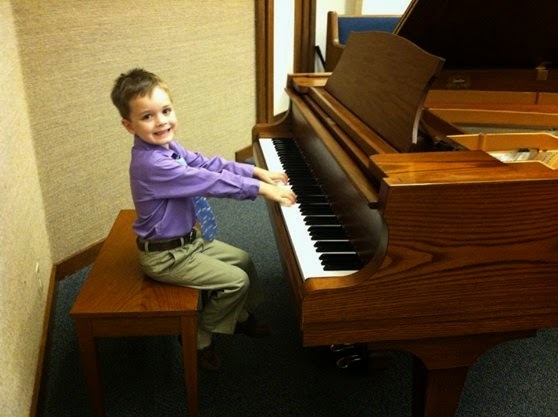 Your very first piano recital - Not much makes me happier than to you singing and making music, so at the beginning of the year, we got you started in piano lessons. You took to it really quickly, and by May, you were ready for your first recital. You played "Monsieur Mouse" and did a great job! 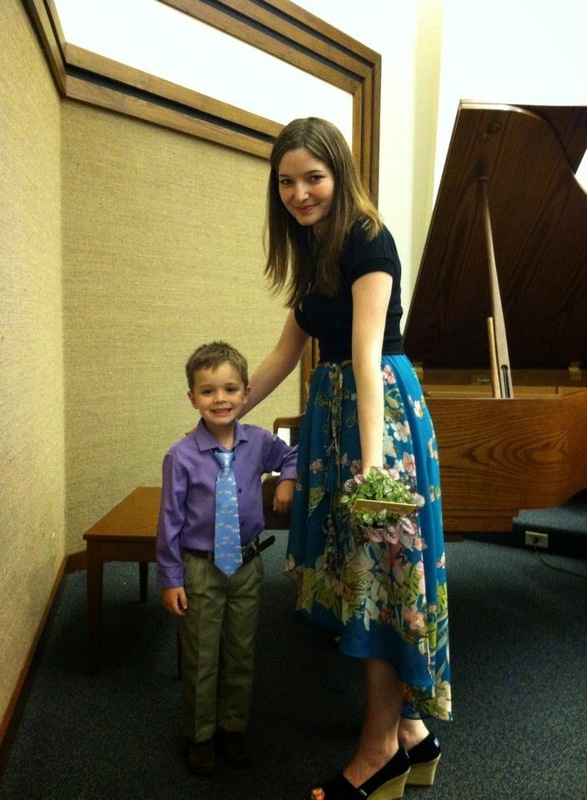 You love your piano teacher, Ms. Desiree, and she is so good with you. You're still progressing really well, and I love hearing you practice your current piece, "We Wish You A Merry Christmas." My little Bear at the piano. 4. 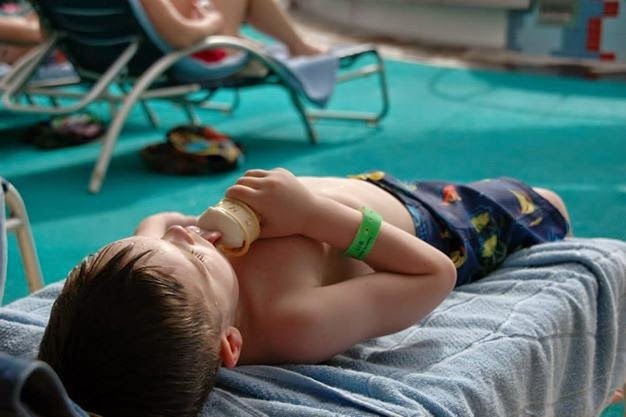 Summer Bowling turns into year-round fun - During the summer, you and I ventured to the bowling alley more than a couple of times to take advantage of the Kids Bowl Free program. And holy cow, did we find something you love! We typically ended up going once or twice a week, and you had a blast. We met new friends Mr. Mike and his son Dylan, and all that practice led us to signing up for the Capital Lanes Youth League. 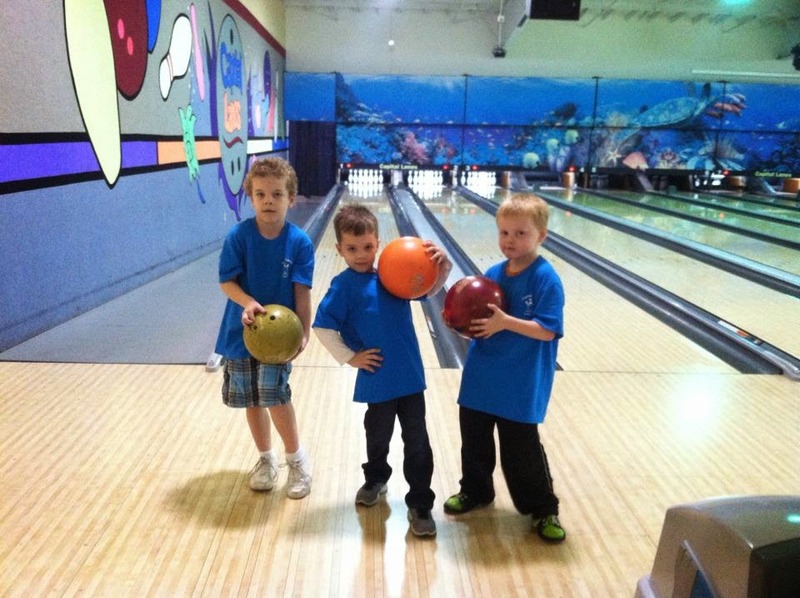 You now bowl every Saturday, without bumpers, with your team-mates, Dylan and Connor. You guys are scary good, and people are impressed with how the three of you bowl. It's so much fun to watch! You're getting closer and closer to beating me, too, so I have had to step up my game and get in more practice. One day, little boy. 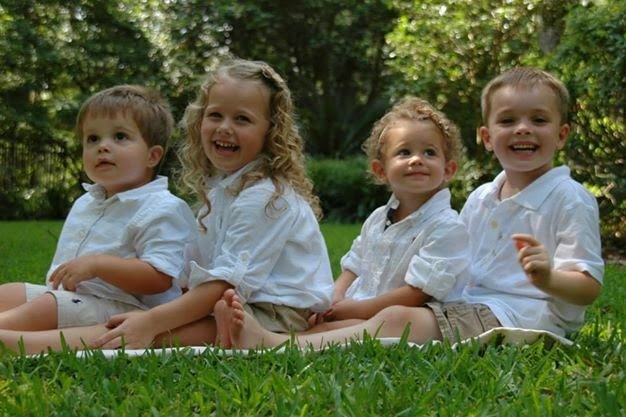 Nole, Payton, Taylor and You - entirely too much cuteness in one place. But I'm biased. 6. Fifth Birthday Festivities - Holy cow kid. You're FIVE!! I will set aside time to write an official fifth birthday post, but for now, a brief synopsis will suffice. You decided on a Halloween themed birthday party, and it was a blast. Kids came dressed in costume, and we had hay rides, fun foods and more candy than should be allowed with small children. 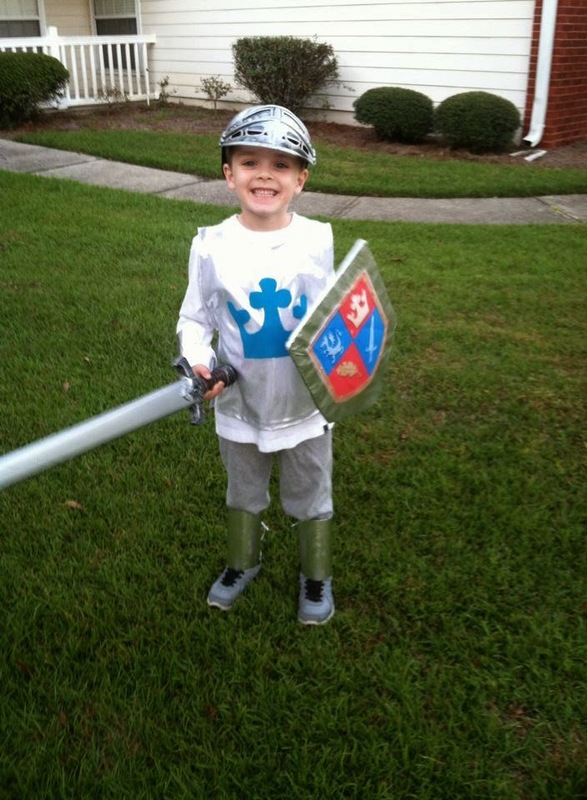 I made your costume again this year; you requested a knight costume, and I think it turned out pretty well. Then to keep the celebration rolling, we took you to Disney for a weekend of the Happiest Place on Earth. Again, it's worth a post of its own, so I will have to get it together and get that done. It was so much fun, and you had a complete blast riding roller coasters and experiencing Disney. I love this picture from our Disney weekend. 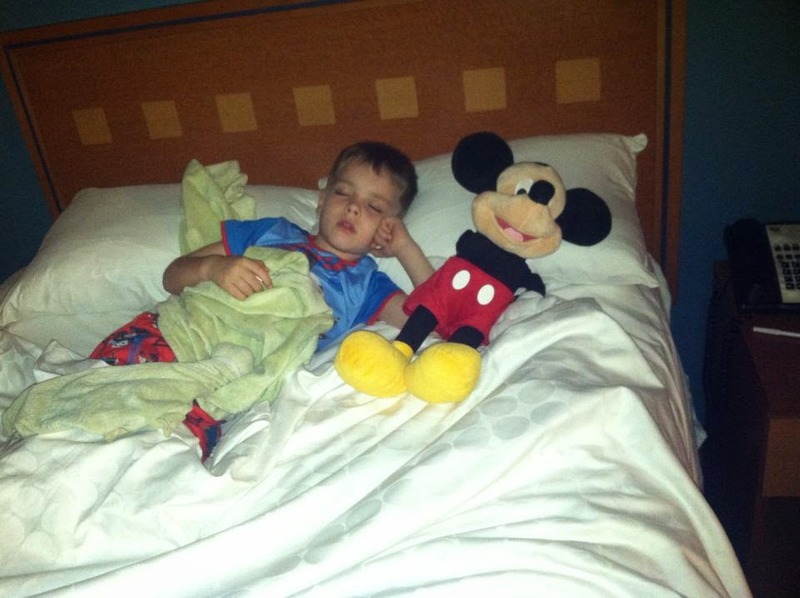 You, completely sacked out after a day of fun, with Mickey Mouse. You in your knight costume. Love that smile. 7. Christmas Spirit - And now here we are at the present. We're getting geared up for Christmas, and I was lucky to have your help in decorating. We put up the tree, complete with your Christmas train, hung stockings and set up your own special tree. We started that tradition a couple of years ago: you amassed quite a collection of ornaments and decorations that you made in school, and I wanted to display them in a special way. So, we put up a small tree in the front hallway and dubbed it "Ian's Tree." All of your special hand-made ornaments are on that tree, and it looks so pretty. You're very proud of it. 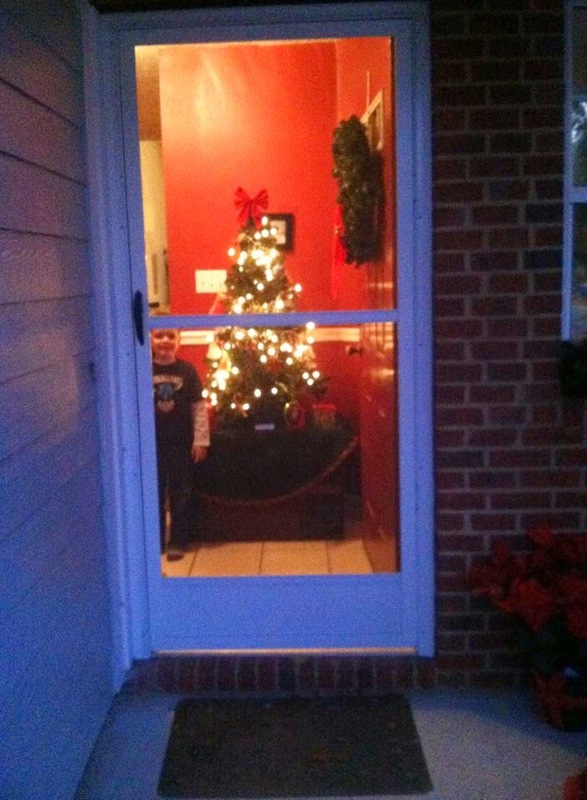 You and your tree peeking through the front screen. All of these little memories are locked away in my heart and mind, and I am so glad I finally sat down and shared them with you. I hope one day you will be able to look back at them and smile, too. You always make my heart smile, Little Bear.